I happened upon this over at April DeConick’s blog and was so fascinated by it I had to post it up over here with some commentary. What immediately struck me was the six that are lying down. 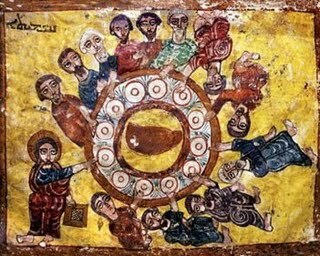 I thought, what a great picture of an early church rendering of an agape meal or Lord’s Supper. Then, I realized that there were also six seated, plus one standing who appeared to be officiating and who stood out due to the ring around his head – a sign of holiness. Then (yes, I can be a little slow, especially when it comes to art) I realized this was, in fact, a rendering of the Lord’s Supper! One person on April’s blog commented that they believed this to be Eastern in origin, perhaps 8th Century. Another revealed that this is on the cover of Bauckham’s Jesus and the Eyewitnesses and stated that they attributed it to the 13th Century. Now, considering that by the mid-fourth Century, many such practices as reclining or lying on the floor during church meetings had been banned (cf. Canon 28, Synod of Laodicea), I would interpret this picture as asserting that the apostles, at least some of them, were indeed reclining at the table during the actual final meal with Christ. So, the implication is that this was either acceptable or normative for such a gathering, even in the presence of Christ himself! Quite different from our Western understanding of how the Last Supper happened – one long table with Jesus in the middle…nice and orderly! So, whether this picture was painted early (1st to 3rd Century) or late (4th to 13th Century) would be interesting to know. Was the artist trying to tell us something? Was it a rebellious move on their part to portray it in such a manner? Or could it simply be completely typical posing no agenda whatsoever? If anyone knows more about this picture, I would love to know the history behind it. Also, what are your comments? What do you see here?